What is Novichok, nerve agent used in attack on ex-spy? LONDON -- The use of Russian-developed chemical nerve agent Novichok to poison ex-spy Sergei Skripal and his daughter makes it "highly likely" that Russia was involved, British Prime Minister Theresa May said Monday. Novichok refers to a class of nerve agents developed in the Soviet Union near the end of the Cold War. The agents were ostensibly created in an attempt to avoid the international chemical weapons treaty that had just been signed; any new substances wouldn't be subject to past treaties. The word Novichok means "newcomer" in Russian. Novichok behaves slightly differently than other nerve agents, with some reports that the class of substances is deadlier than similar chemicals like sarin or VX and harder to identify. "Novichok agents significantly extend the range of possibility for nerve agents," said Andrea Sella, a professor of inorganic chemistry at University College London. There are five known nerve agents, which are mostly colorless liquids that can kill within minutes if ingested. "With Novichok, you have the potential for a slower-release agent, which gives you much more control," Sella said. "Using Novichok makes it pretty clear that it was likely Russia that was behind this." Nerve agents are typically inhaled or absorbed through the skin. They work by blocking a key enzyme that controls communication between nerve cells and muscles -- inhibiting the enzyme causes muscles and glands to be overstimulated. That results in symptoms including contracted pupils, vomiting, breathing difficulties and convulsing muscles. How did it get into U.K.? 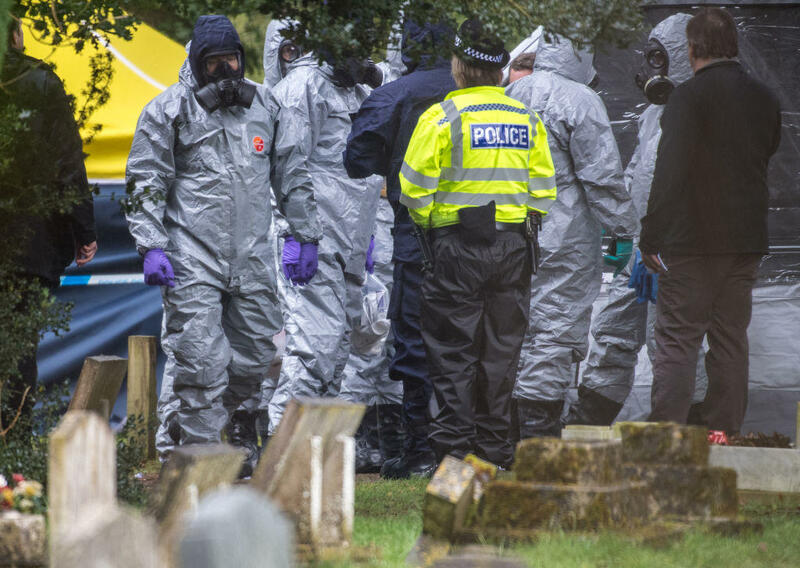 Gary Stephens, a pharmacology expert at the University of Reading, noted that the component ingredients of Novichok nerve agents aren't on the banned list. "It means the chemicals that are mixed to create it are much easier to deliver with no risk to the health of the courier," he said. Andy Oppenheimer, a biological and chemical specialist, told Britain's Sky News that the chemical could have been brought in through an airport. "These things can evade detection if they are very small amounts and very well shielded, whether they are biological, chemical or a biological agent," he told the network. "This chemical may have come through an airport, we really don't know yet." While the raw materials needed to make a nerve agent are cheap and relatively accessible, transforming them into a deadly weapon requires specialized expertise and the kind of safety precautions normally only found in government laboratories. But trained chemists with access to secure facilities would theoretically be able to produce nerve agents, which have been described by some scientists as the most deadly invention humans have ever made, after the atom bomb. "With these kinds of substances, they are just so dangerous that no fly-by-night terrorist group is going to cook this up," Sella said. "It really smells like a government outfit," he said, adding that nations other than Russia would also be capable of producing Novichok. Alastair Hay, a professor emeritus of environmental toxicology at the University of Leeds, said it was possible the Skripals' food was contaminated or the nerve agent was absorbed through the skin, which could take an hour or longer if the substance was administered using something similar to a nicotine patch. People attacked with Novichok can potentially be treated with compounds called oxines, but recovery would depend on how quickly doctors are able to pinpoint the right compound, according to Hay. Since nerve agents affect the respiratory center in the brain and reduce the amount of oxygen in the body, the primary worry for people exposed to nerve agents is brain damage, he said. "All of the evidence is that for people who are this severely poisoned, is that a full recovery is far from guaranteed and they may have residual problems as a result of damage to the brain," Hay said. Scientists will likely be analyzing any trace amounts left of the Novichok to determine which lab might have produced it. Experts said any remaining bits of the substances used to make the nerve agent or impurities left by the chemical reaction used in the manufacturing process could be revealing. "Those might give you a clue where it was made," Hay said. "Intelligence agencies and governments have a reasonable idea about the different processes that have been used and which countries use specific methods of manufacturing." Still, he said this wasn't an exact science and that police would have to gather evidence beyond the laboratory to narrow down where the nerve agent originated. Any samples of the Novichok left in the environment could also be useful as police construct a timeline of the attack -- analyzing where the agent was left in the highest concentrations will help determine where Skripal, his daughter and the police officer who first responded were exposed. Hay said that among the crime's biggest mysteries is why the perpetrators even chose to use Novichok. "If you wanted to kill someone, there are much more effective ways to do this than to go to these lengths with something that's so identifiable," he said. "But maybe that's part of the message," he said. "Maybe this is just somebody saying, 'we don't care if you identify us as the attackers and we don't care if you know.'"